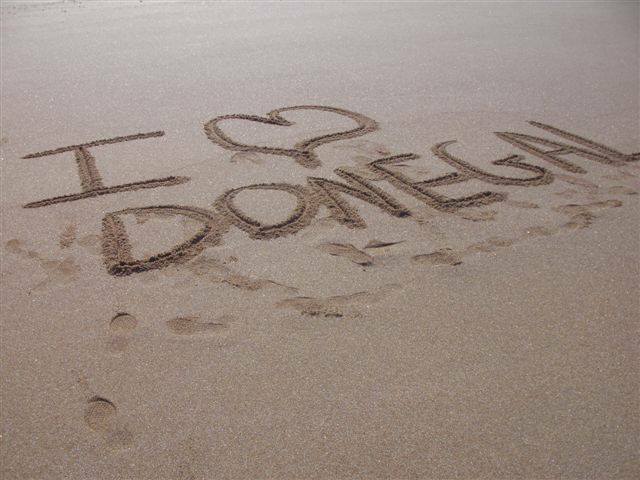 County Donegal is tailor made for the walking enthusiast. Here the pace of life is somewhat slower and you will find a wide choice of winding roads, rolling hills and spectacular coastal walkways. 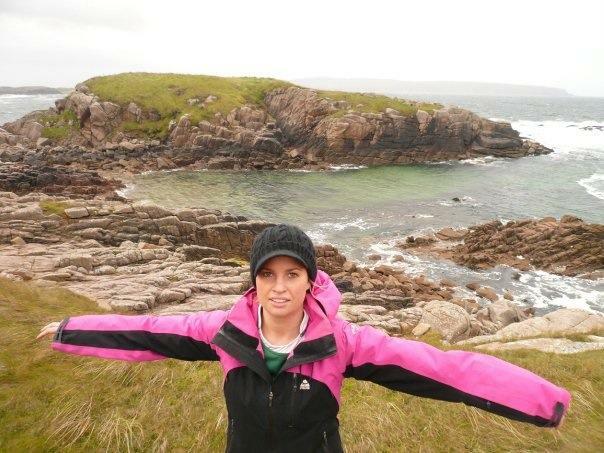 Among our recommendations would be the loop around Crohy Head near Dungloe, the loop around Horn Head known as Atlantic Drive, Bloody Foreland with Innisboffin and Tory Island out to sea, The Poison Glen with the black waters of Dunlewy Lake below and the white capped pyramid of Mount Errigal above, The Barnesmore Gap and of course the majestic cliffs of Slieve League dropping 300 metres to the sea. However, if the above is a little daunting and you are interested in somewhat more leisurely and casual walking you will find that the seven walks we have set out below offer a truly refreshing and exhilarating experience. Here you will be based at Donegal Thatched Cottages on Cruit Island. Each walk will start at your own cottage and return back in a circle to your cottage. Each walk is different to the previous one and offers an opportunity to explore this beautiful Island. The walks are designed for those who love walking for its own sake but also wish to return home in anything from one hour to three hours. Of course you still have the option of participating in any of the above more serious walks, all of which are within an hour’s drive of Donegal Thatched Cottages. Cruit Island is a real walker’s paradise. Here you will find deserted sandy beaches, hidden sheltered coves, magnificent granite rockscape , cliff pathways with breathtaking views, thunderous Atlantic breakers and an almost constant fresh sea breeze. A number of the walks listed on this site, other than those on public roadways and beaches, are across privately owned lands. We, at Donegal Thatched Cottages, make no claim whatsoever to those lands nor do we seek to establish any rights over them. Walkers who choose to use these beautiful pathways do so of their own free will, at their own risk, and at the discretion of the various landowners, who together with Donegal Thatched Cottages, accept no liability for any injury sustained in the process. Walk 1. ( approx.1.5 hours ) Suitable for able-bodied and reasonably active persons. Coming out from the entrance to the cottages turn left. Follow the roadway for about 1 mile ( 1.6 Km ), noting Kincasslagh Bay on your right, the white capped pyramid of Mount Errigal in the distance and across the bay the Martello Tower on Mullaghderg Hill. Seagull Island in the centre of Kincasslagh Bay is little more than a stone’s throw away while further out to sea is Gola Island, deserted in the 1960’s and immortalised in the haunting lament Baidin Fheidhlimidh. Just off the western tip of Gola on a clear day you may see the outline of Tory Island, 9 miles out to sea and the last outpost of Gaelic civilisation. The two-storey farmhouse on the right is the home of the Mc Bride family, composers of The Homes of Donegal and several other famous Irish ballads.The next large dwelling on the right hand side is the former family home of Donegal’s most famous son, Daniel O’ Donnell. As you approach Cruit Island Golf Links be alert to players playing from your left. You have the right-of-way but that is little consolation if you are struck by a golf ball! As you come to the next bend on the road look out for players teeing off the ninth tee-box on your right. You now see Owey Island, once home to thirty families, but deserted since 1974. The Golf Clubhouse is on the left, looking across the strait to Owey Island. You are welcome to call in for a quiet drink or a light snack and return to the cottages the way you came. 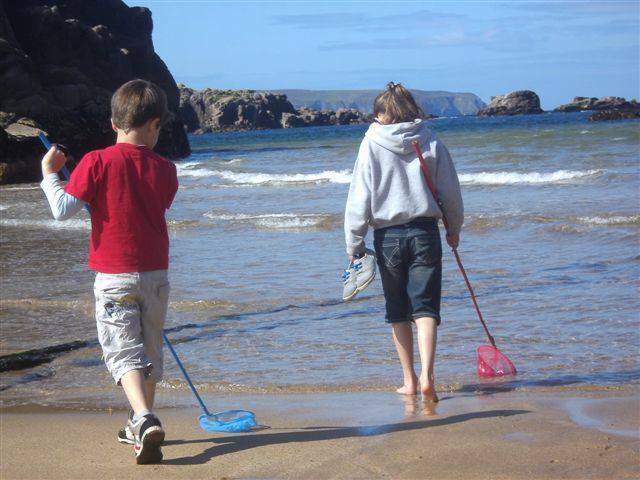 However we suggest you continue on past the Clubhouse and take the beaten coastal pathway right back to the cottages. This is the best part of the walk……truly wonderful. You will pass three beautiful deserted storm beaches and a sandy cove before climbing the cliffs nearer the cottages. As you look out to the open Atlantic and see the white cottages on Arranmore Island you will feel that it is good to be alive. When you finally mount the plateau of rock and get your first glimpse of the thatched cottages with Tra Dhearg beach in the background you will be glad that you chose Cruit Island for your holiday destination. Of course this walk can also be approached from the opposite direction…….down to the Clubhouse by the coastal pathway and back by the roadway. This walk is entirely by public roadway and can be taken at a leisurely pace by any able-bodied person. Coming out of the cottages turn right and follow the main Cruit road for about a mile noting the graveyard to the right and the miles of safe sandy beach to the left. Do not turn right at the Failte sign as in Walk 2 and do not take the right turn at the graveyard but take the next right turn a further half mile on. This will take you in a horseshoe back on to the main Cruit road via a very pleasant rural laneway with the Atlantic Ocean and rugged indented coastline on the right. Look out for wild duck and snipe. This inland area of Cruit has so far escaped development is quite reminiscent of Connemara in its general terrain. When you come to the T-junction at the main Cruit road turn left and walk back towards the cottages. This walk is a combination of public roadway and shoreline and can be taken at a leisurely pace by any able-bodied person. It can be taken even if the tide is fully in. Coming out of the cottages turn right towards the graveyard about .75 miles distant. Take the left turn opposite the graveyard and proceed for a few hundred metres till you reach the sandy beach of Kincasslagh Bay with Monument Island directly facing you. Turn left and walk back along the shoreline towards the enclosed sandy cove. Climb the bank and make your way by beaten track back to the main Cruit road where you turn right towards the cottages. An easy and leisurely walk suitable for any able-bodied person. This walk is a combination of public roadway and sandy beach. It is only to be undertaken when the tide is well out. Coming out of the cottages turn right for about 300 metres. Access the sandy beach on the left through the pedestrian right-of-way just to the right of the wide gate. Once on the beach head straight across towards the sandy beach on the opposite side of Kincasslagh Bay, bearing in mind that the tide must be well out and there will be a shallow stream to cross on the far side. Once across head up to the road and turn right for the village of Kincasslagh about 1 mile away, noting that the large house on the left is the former home of Daniel O’ Donnell. When in Kincasslagh you could call in to “Iggy’s” for a pint or a seafood platter. In Kincasslagh use the pedestrian right-of-way to access the beach again and head back diagonally towards the cottages making sure that the tide is still out. This part can be a little soft so you may have to resort to “bare feet”. A very pleasant walk for those who enjoy walking in bare feet. Bring the walking boots also however. This walk follows the same trail as Walk 5 except that when you come to KincasslaghVillage you turn right at the T- junction and follow the main road back to the Viking Hotel about 1 mile distant. Opposite the Viking Hotel you turn right where Donegal Thatched Cottages is signposted. About 100 metres down this road bear left and follow the road over the bridge onto Cruit Island. The cottages are a further two miles down the Cruit road. This walk is only for those who are quite active as it takes nearly three hours. This walk is only suitable if the tide is out as it includes both road and beach walking. It is also more suitable for those who are quite active as it takes well over two hours. Coming out from the cottages turn right and follow the main Cruit road all the way up to the bridge, about two miles distant. About half a mile past the bridge take the first left turn leading down to Kincasslagh Church. At the Church you will see an entrance onto the beach. The first few hundred metres may be a little soft so you may need to go bare-foot. Head for Monument Island straight ahead but keep the Island on your right hand side. After that you will see the cottages on the skyline in the distance and the remainder of the walk is the same as in Walk 4. Rather than keeping left of Monument Island and skirting the shoreline you could choose to go straight ahead and walk along the water’s edge in your bare feet……an exhilarating experience…..